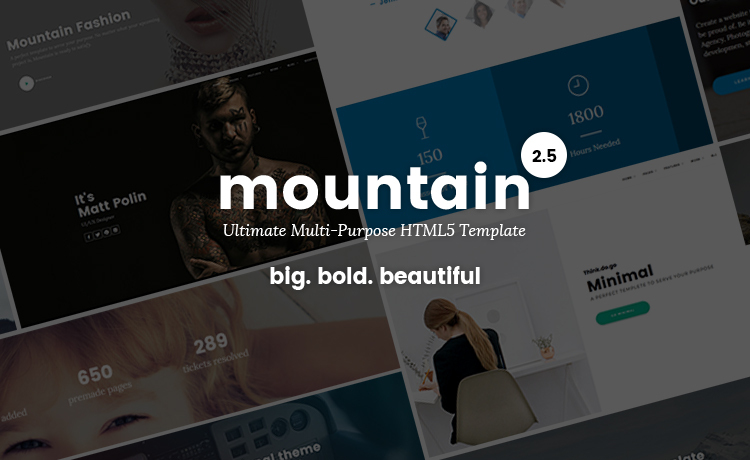 The Ultimate Multi-Purpose HTML5 Template – Mountain; the new big HTML template at ThemeWagon. You can build a beautiful website with this great template. The template is 100% responsive, hand-crafted carefully for the best suite for a developer as well as for noncoder. Latest web technologies like Bootstrap 3, HTML5, CSS3, jQuery, SAAS, etc. were used to build this beautiful multi-purpose HTML template. Mountain is an incredibly flexible, completely developer-friendly, easy customization and cleanly coded. Mountain is smartly Responsive, hand-crafted for mobile and smaller devices. You can browse this ultimate multi-purpose HTML5 template from any browsers – the feel will be same. People love Mailchimp and so do we. We have added a functional MailChimp code in Mountain – the ultimate multi-purpose HTML5 template. You need to copy your MailChimp code and replace with ours – DONE! No coding required. We have also made the contact form working. You will get a piece of PHP coding in the template. All you need to do is to change the email address – where you will send the email. Super easy multi-purpose HTML template to use in your next big project. And we have documented everything for you – from significant changes to smaller ones! Nice & Easy. Mountain is 100% responsive multi-purpose HTML5 template. It’s built by professional – built for professional. If you are looking for a great professional website template for any kind of website, you can use this ultimate multi-purpose HTML5 template. 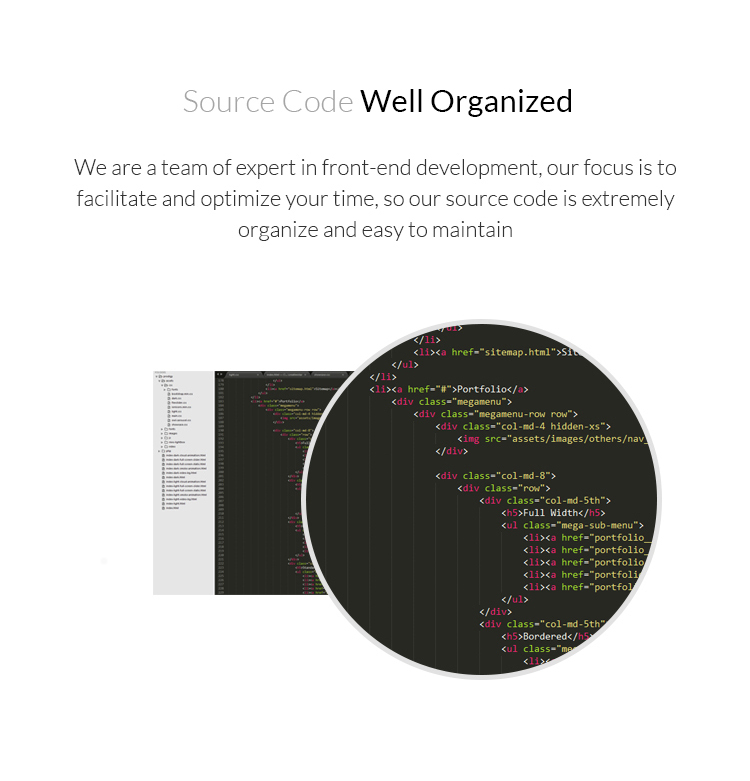 You will get great support, well documented code and great documentation. The multipurpose HTML template is tested in Google Mobile-Friendly Test. This is a fully responsive multipurpose HTML5 template. The template is also fast loading and cross browser tested. Mountain – A template worth your time and money! ThemeWagon is known for its excellent customer support. We are helping thousands of user making their lives easier by helping them developing a great website. Browsing your live site is our satisfaction, and we will stick with you until you wrap it up. You’ll get a quick response and 5-star customer support. You already know how important the search engine optimization is! It is a key factor for your website to rank in Google. We put a lot of effort to make this ultimate multi-purpose HTML5 template SEO friendly. All you need to do is to change the meta title, meta description and add your own so that your website ranks well for your keyword or a set of keywords. 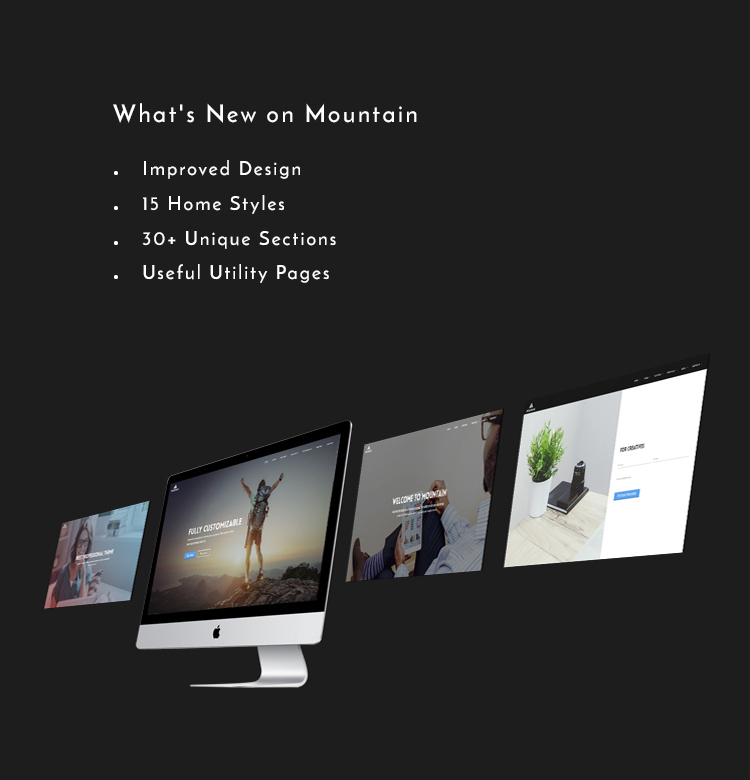 Use Mountain – the SEO-friendly high-performance HTML5 theme for your next website project. From the very basic HTML website to large corporate website – all you can do with Mountain – The Multipurpose HTML Template. As the name suggest, this site template can be used for personal website, corporate website, agency website, startup website, wedding website, portfolio website, photography website and so on. We will be adding new sections and pages each week in this multi-purpose HTML template. You will get the free update after purchasing it for the first time with half payment. Isn’t it cool? If you think you need any customized section in this Ultimate Multipurpose HTML5 Template – Mountain, please email us. We will add the section in our next update. Any other recommendations are most welcome. We are offering Mountain – the Ultimate Multi-Purpose HTML5 Template for only $9. We will increase the price as we will be continuing development of this premium template. So buy now and get elementary free updates for lifetime. The early buyers will get it for the low price. So don’t miss this awesome template. Another most amazing fact about Mountain is Lifetime Free Updates. Any new release will be added to your dashboard. Even after years, you will get access to the latest version of this amazing multipurpose website template. Isn’t that cool? - More functional and lucrative headers. - Around more than 40+ generic sections are added to make various kinds of beautiful pages. - More functionable and lucrative headers. - 4 corporate layouts & 2 portfolio layout. - Coming Soon Page & Subscription Page are added. - Instagram feed & Flickr Photostream are integrated. - Blogging is active with disqus comment box. - Various kinds of menu styles are added. - Gallery Masonry & Masonry portfolio is compitable with Mozilla browser. - Lucrative headers are added with more functionality. The exact theme I was looking for! Mountain doesn't provide sufficient support. However, if you learn how to use, that template really good for you to make a good website. Whole the template is more than perfect. Recognize it for yourself. Excellent support. When I bought the item, I had several small issues, but the support was excellent and was solved. Thanks a lot. No hassle!! Everything works correctly. Easy setup, epic design. I'm extremely satisfied with this theme!!! I really choose this template. I've been able to embed together what I consider is excellent viewing content much faster and more consistently than ever earlier. The code is clean, and the design just works so well for me and my taste.